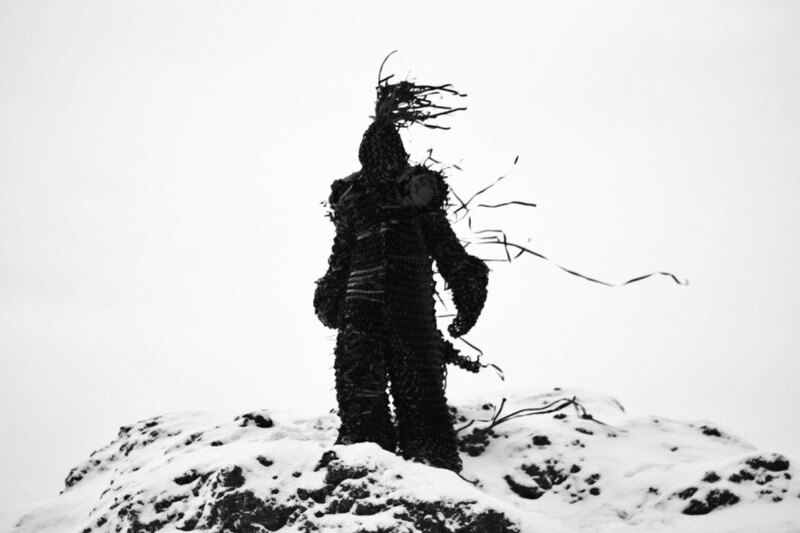 Creepy and darkly beautiful giants have risen on Iceland’s frozen landscapes. These faceless figures seem like the stuff of nightmares, but take a closer look and you’ll see they’re actually made of a material we’re all once familiar with: VHS tapes. Artist Philip Ob Rey created the “V” HS Project, an installation/photography project made from discarded and tangled webs of VHS tapes. The haunting creatures were partly inspired as protest against plastic pollution and mass media. Philip Ob Rey’s V project was designed in collaboration with Louie Otesanek and photographer Mailie Viney. 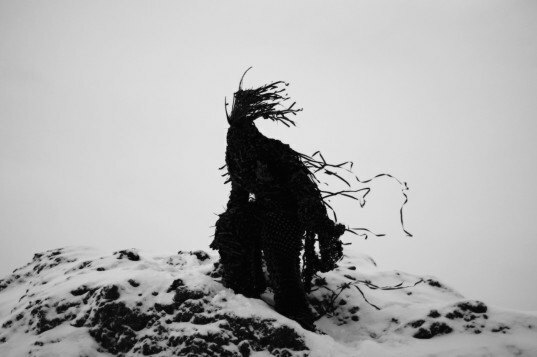 The black-and-white photographs show the mysterious Lovecraftian figures in a desolate post-apocalyptic terrain. Some of the god-like creatures appear to be in mid-motion in the wind, while others are crouched in place or hidden away in caves. The sculptures are crafted from VHS tapes and other locally sourced found objects like feathers, stones, shells, and dry seaweed. Philip Ob Rey’s V project was designed in collaboration with Louie Otesanek and photographer Mailie Viney. The black-and-white photographs show the mysterious Lovecraftian figures in a desolate post-apocalyptic terrain. The sculptures are crafted from VHS tapes and other locally sourced found objects like feathers, stones, shells, and dry seaweed. The film-wrapped figures are more than just an eerie silhouette; they also serve as stoic warnings against environmental destruction. The haunting creatures were partly inspired as protest against plastic pollution and mass media. Some of the god-like creatures appear to be in mid-motion in the wind, while others are crouched in place or hidden away in caves. “They are covered with a black toxic skin, [a] chaotic flesh of magnetic encoded images,” Ob Rey said to Beautiful Decay.